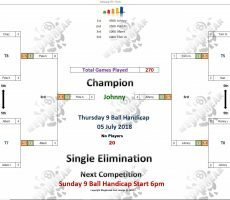 THURSDAY 9 BALL – 5th JULY : JOHNNY WINS. 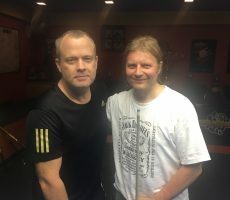 We had a first time winner in last night’s 9 Ball Competition. 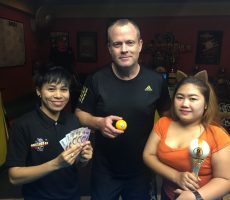 Johnny Whitley from England, who has been a regular player with us for the last six weeks, and who was playing in his 16th competition, went all the way to claim the 1st Prize of 4500 baht. 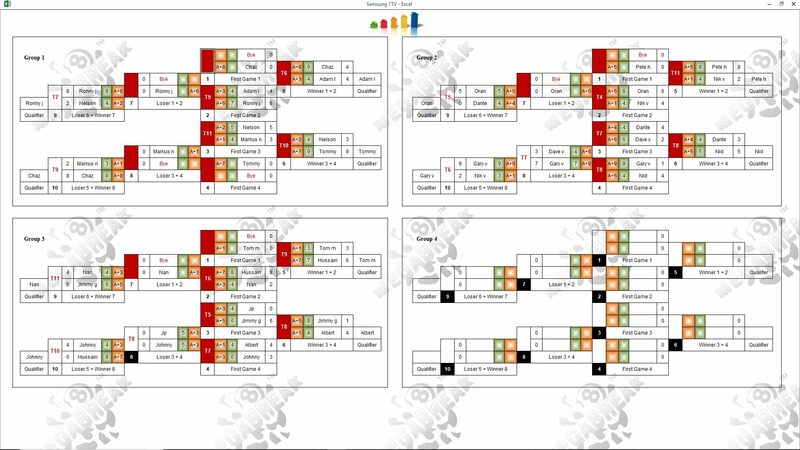 He actually lost his very first match of the night in the group stages, before upping his game to win five matches and lift the trophy. 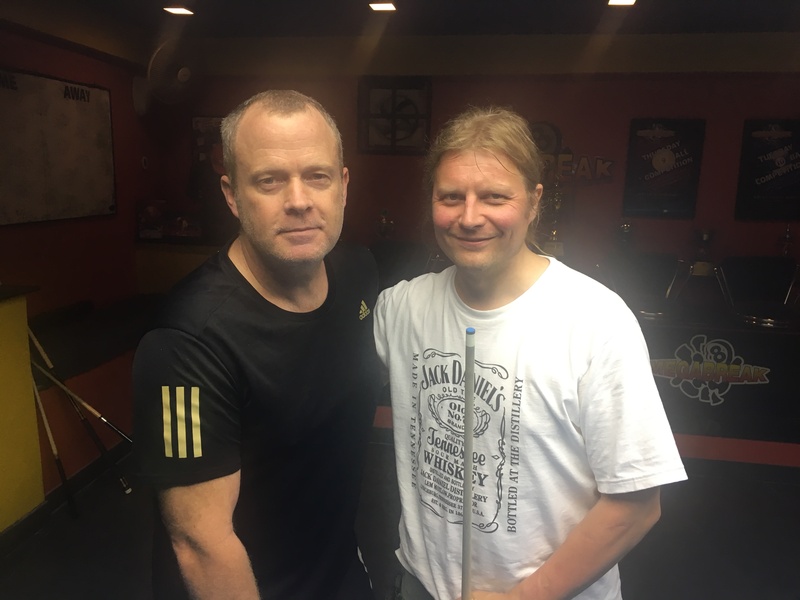 From a total entry of 20 players, he beat Pete Heininen from Finland in the final by 4 racks to 3 (race 4-6). 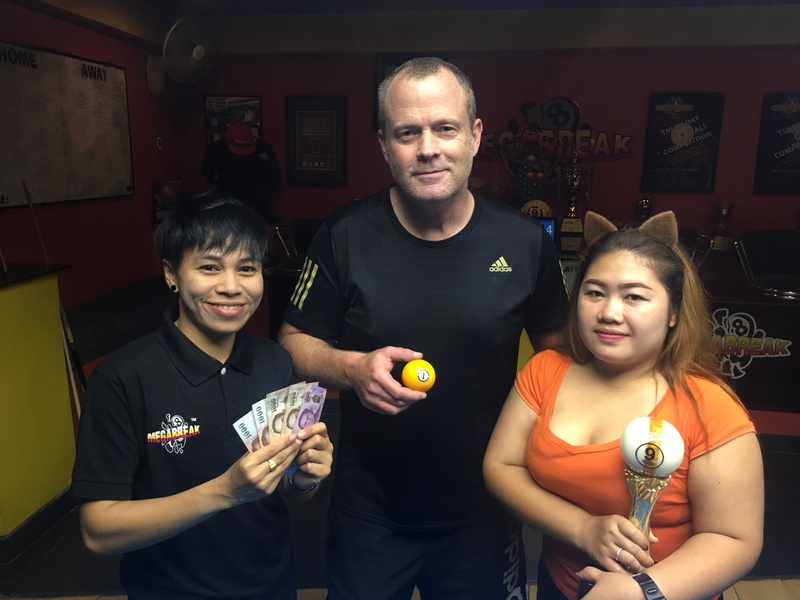 Pete, who was playing in just his third Megabreak competition, did well to reach the final, and received 2500 baht as Runner-Up. 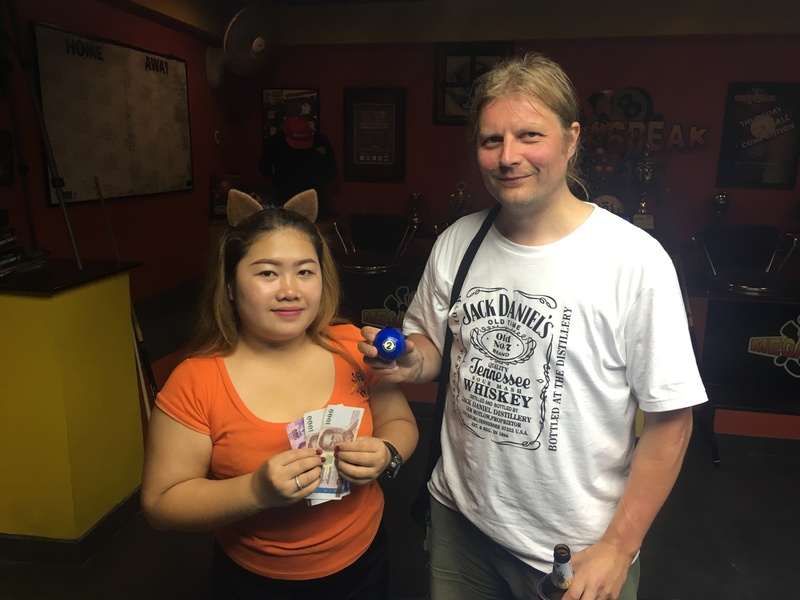 The other money winners on the night were our resident Dutchman Albert Gringhuis, and Tom Moore from The USA, who each collected 1000 baht for reaching the semi-finals. 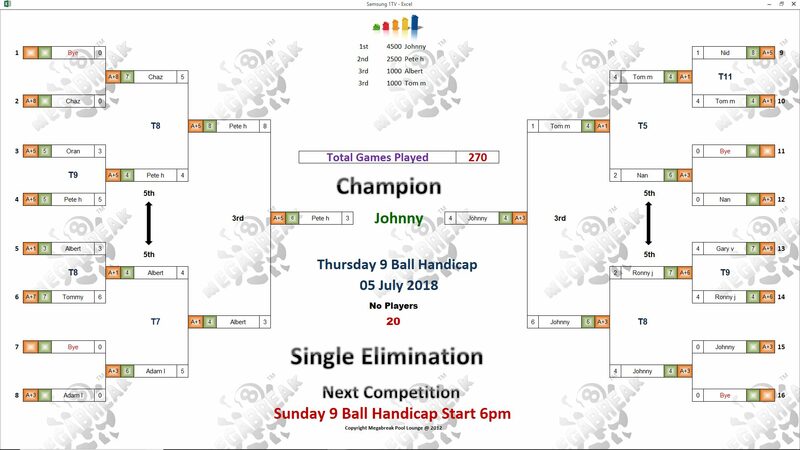 Champion : Johnny (A+3) – 4500 baht. 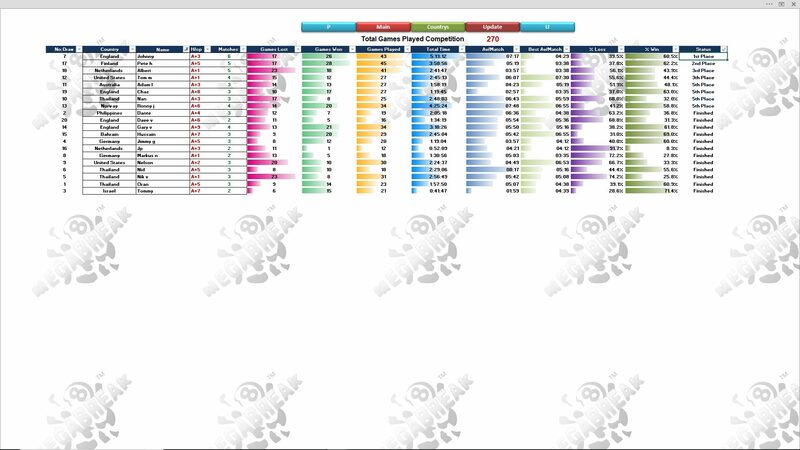 Runner-Up : Pete (A+5) – 2500 baht. 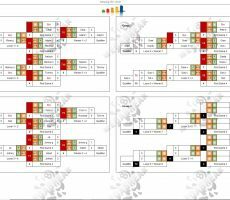 Semi-finals : Albert (A+1) and Tom (A+1) – 1000 baht each. Gary Vinson dominated the Player Auction which created an extra Prize Fund of 14600 baht. 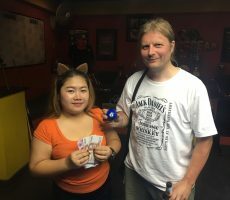 He bought both Johnny (700) and Pete (500) in 1st and 2nd for just 1200 baht total, and pocketed the combined amount of 10400. 1st (40%) : Gary (Johnny) – 6000 baht. 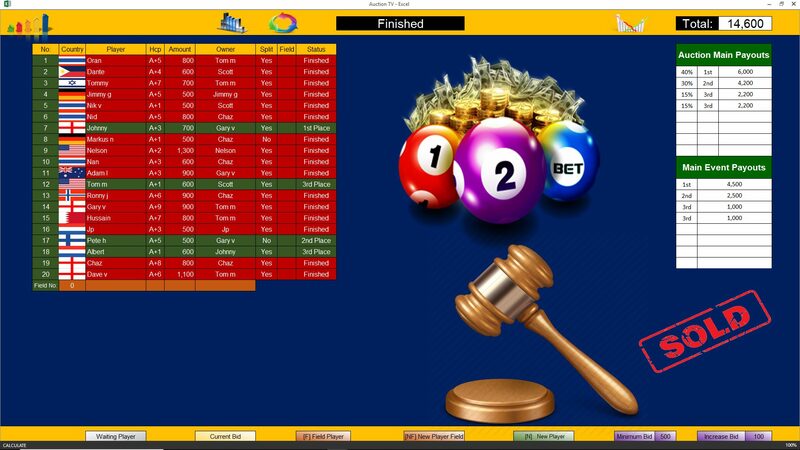 2nd (30%) : Gary (Pete) – 4200 baht. Equal 3rd (15%) Johnny (Albert) and Me (Tom) – 2200 baht each.